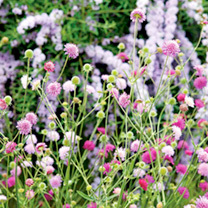 Verbena Bonariensis - A profusion of tall, wiry stems carrying tufts of tiny flowers that bring a soft and airy feel to your displays every summer. Flowers June-November. Will flower up to first frosts! Height 100cm (40"). Back of border variety. 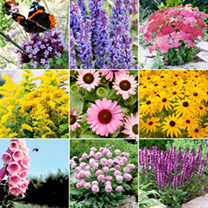 Achillea Millefolium Summer Pastels - Large heads of tightly packed flowers are produced above the aromatic foliage to produce an explosion of colour in late summer of different colours to produce a magnificent display. Solidago Little Miss Sunshine - The bright yellow plumes of flowers produce a bright display in late summer. Being a more compact and non-invasive variety, it is much more suited to a garden situation and its different flower form makes it stand out in the border. Flowers July-September. Height 20-30cm (8-12"); spread 20-30cm (8-12"). 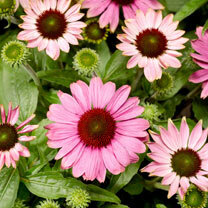 Echinacea Prairie Splendour Rose Compact - Echinacea Prairie Splendour Rose Compact - A lovely light pink variety that has been bred to develop more shoots than many varieties and therefore more flowers. 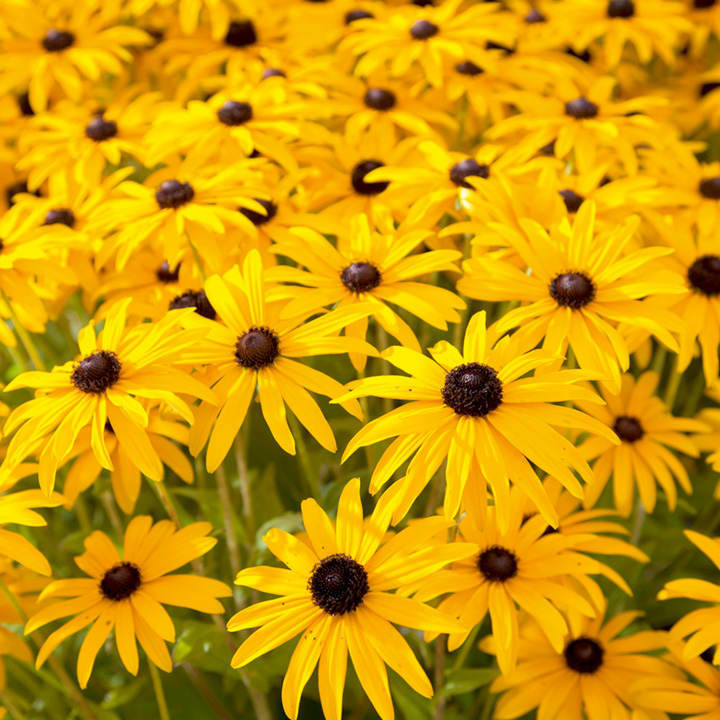 Being sturdy and compact it will produce a lovely display with the golden brown centres from mid summer. Flowers June-October. Height 50-60cm (20-24"); spread 50-60cm (20-24"). Digitalis Summer King - A vigorous yet compact digitalis, producing many spikes of tubular, vivid pink coloured blooms. Flowers mid July-late August. Height 70-80cm (28-32"). 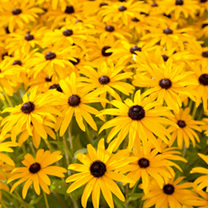 Rudbeckia Goldsturm - A border favourite, producing masses of long-lived, golden-yellow blooms with dark centres. Vibrant autumn flowers. Ideal for cutting. Flowers August-October. Height 69cm (28").Middle of border variety. Salvia New Dimensions Blue - A compact form which produces a rich display of violet-blue flower spikes produced in great profusion from early summer, will create a bold display of colour above the aromatic foliage. If cut back after flowering in mid summer, a second flush of flowers will also help to create colour in the garden when many other plants are starting to fade. Penstemon Electric Blue - A fully hardy, low-growing penstemon producing multiple spikes of impressive electric blue flowers that are tinged with pink before opening fully. Flowers June-September. Height 45cm (18"). Middle of border variety. 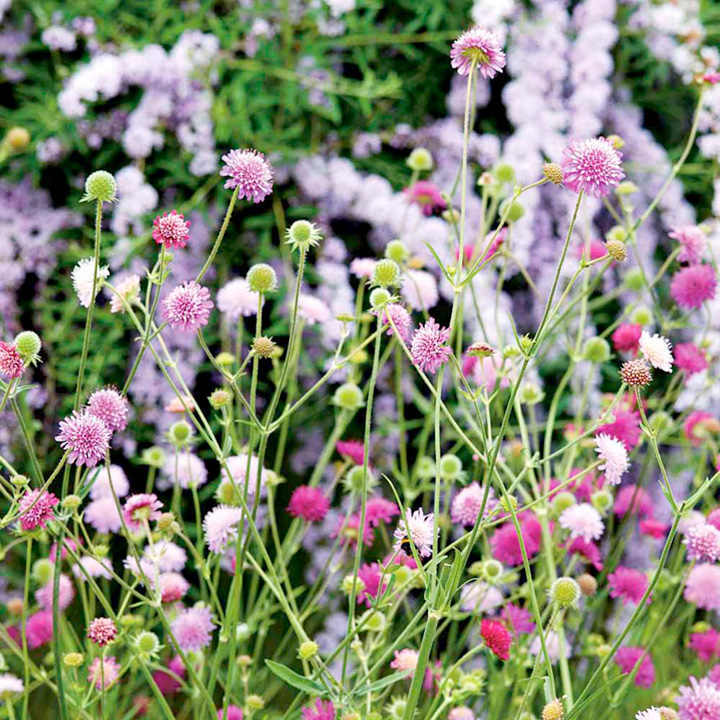 Knautia Melton Pastels - Provides a long succession of colour, producing masses of large flowers in a mix of subtle shades, held above bushy clumps of mid green leaves. May produce some blooms in its first year. Flowers late May-September. Height 90cm (3'). Back of border variety.